“Mum, we’re allowed to dress up for the swimming carnival! Can you make me something?”. Year 7 is so exciting for the Muffet, they’re allowed just that little bit more freedom and it’s going to their heads. Swimming carnival is on Friday, and it isn’t compulsory to attend, unlike primary school. It is, however, very strongly encouraged and the Muffet wouldn’t miss it for quids. Especially as you can dress up. Looks like it’s time to get out the ole sewing machine again. The first thing is to decide what to make. A hat? Hair’s going to be wet for some of the time, so no. Some kind of outfit? I still haven’t recovered from the school play. You know what I’m pretty good at. Capes. They’re only a step up from baby blankets and I’ve made wizard ones, fairy ones, a Red Riding Hood and a Jedi one. With or without hoods, they are dead easy and you don’t need a pattern. Muffet wants a swirly one in her house colours, so I stuff her house shirt in my handbag and it’s off to Spotlight I go. Her house colour is maroon, so if we lived in Brisbane I’m sure the whole house would be decked out in footy memorabilia. As it is, I’m surprised at the choice of materials available that exactly match her shirt. Dance satin is on special, so I get three metres of it and six metres of maroon fringe, plus some black and white balls of that yarn you knit into spirally scarves and a set of knitting needles to replace the ones the dog ate. For a travelling cape you make trapezoid panels, a big one for the back and two halves for the front and it sits close to the body. For a swirly cape you need a semicircle. I spread the material out on the floor and measure the width. It’s one hundred and thirteen centimetres, so I draw on the wrong side a semicircle of that radius. See, you should pay attention in maths. I cut out a semicircle for the neck of radius twenty centimetres. I’m not going to get all fussy about finishing touches, but I don’t want to leave the neck edge raw and I don’t want to muck about with facing and fusible interfacing, so I make a smaller cape to shoulder height to sit on top with exactly the same neck cutout. This has a fifty centimetre radius. 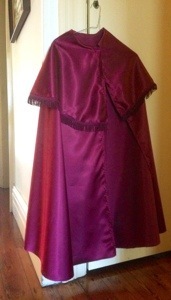 I hem the front edges of the larger and smaller capes, then sew the maroon fringing around the edge of the smaller cape. Then, concentrating tensely, I place the shiny side of the short cape against the rough side of the long cape, line the neck edges up and sew them together. I got it right first time! I don’t even need to press the seams as the material is heavy enough to sit properly. A tab of Velcro at the neck corners and I’m done in under an hour. How popular am I going to be when the Muffet gets home? But then again, how long will that popularity last?